Aaron T. Jones founded International Protective Service, Inc. (IPS) in 2006. 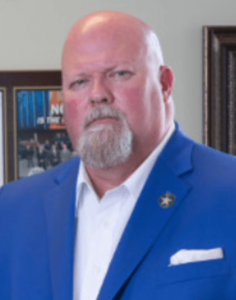 Since then, the armed security guard company has expanded into many different states and will soon expand internationally, with a management team that represents some of the most experienced security professionals in the Industry. Mr. Jones is a native New Mexican who began his security and law enforcement career in the Los Angeles – Beverly Hills area in the early 1990s. Aaron quickly worked his way into the security industry working for John Carden, a retired Beverly Hills PD Sergeant who founded the renowned Officers Group. Aaron worked hard and was honored with the task to direct protection detail for Foreign Royalty from Saudi Arabia and South Korea as well as various celebrities, dignitaries and corporate executives. Mr. Jones later went to the police academy and became a police officer in the City of Los Angeles. He returned to New Mexico in the late 90s and became a Deputy Sheriff. He was very successful in criminal investigations where he served the last eight years of his law enforcement career investigating many high profile cases. Detective Jones transitioned his Police career working Homicide and Violent Crimes to establishing the most elite security and investigations firm in the southwestern United States. International Protective Service was formed in 2006 and has provided security and investigations for everyday citizens as well as high profile dignitaries and celebrities alike. With a reputation for outstanding performance, IPS grew into a leader in the industry. Mr. Jones later formed a partnership with longtime friend, Dr. Barry Brooks and IPS Director of Operations, Mario Romero to form International Protective Service Training Academy. The goal at IPSTA is to successfully train agents and protective detail from all over the world to become the very best in the business.